There are many famous restaurants so have a look around and just try to book a table during the day, if you find something nice. Just note that dinner time is around 10 pm. If for 10 pm all table are reserved ask if you can have one around 8 to 9 pm. 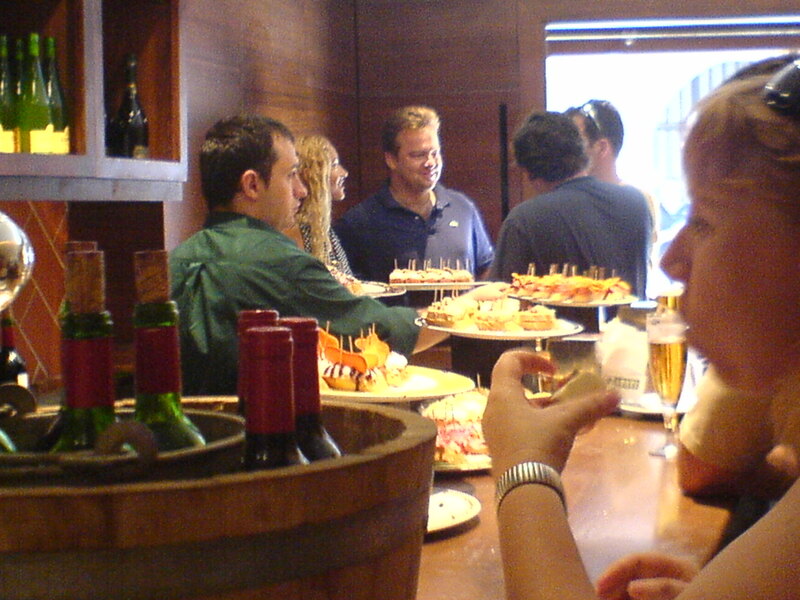 Tapas are not the speciality of Catalunya, but you still get great ones here. I prefer the basquestyle tapas were you stand at the bar and just eat them as you like and later you only pay the little wooden sticks of the ones you had: a bit sushi style. A good tapas bar is next to the church Santa María del Pí, but unfortunately I can’t remember the name. A “Chocolate” is something beautiful: hot, sticky chocolate, more like a dessert than a drink and some sweet pastry do the trick, but a coffee at the beach is nice too. Or maybe you might want to grab a sandwich from Pans & Company and the like. They are nothing like Subway sandwiches: crusty and crunchy baguettes e.g. with a slice of tortilla. This entry was posted in Spain and tagged Barcelona, Cafe, Catalunya, Food, Restaurant, Short Trip, Travelling by kathatravelling. Bookmark the permalink.